Originally published in 1940, this is a contribution to the better understanding of Evangelical experience and doctrine. It is the author’s belief that the application of psychology to religion in general can make little or no further advance except through the study of particular types of religious experience. 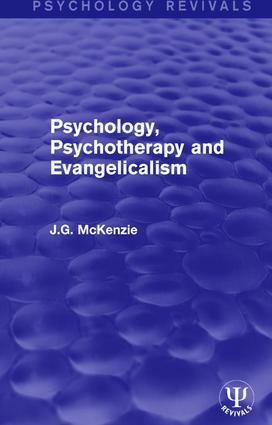 The various psychotherapeutic techniques provide the means for such a study, and in this volume they are applied to Evangelicalism. At first the author attempts to justify this application to Evangelical experience and doctrine, and outlines what he believes to be the essence of Evangelicalism. Part 2 of the book begins the contribution proper with an attempt to get a clear view of conscience and proceeds to salvation and its problems: conversion, guilt, sin, forgiveness, atonement. Part 3 deals with Evangelical experience and doctrine and the spiritual life of the Evangelical, and concludes with some general applications of psychology to Church work. Preface. Part 1. 1. Introductory 2. The Meaning of Evangelicalism Part 2. 3. Prolegomena to Evangelical Experience 4. Salvation and Its Problems 5. Salvation and Its Problems: Conversion 6. Salvation and Its Problems: Guilt, Sin, Forgiveness, Atonement Part 3. 7. Evangelical Experience and Evangelical Doctrine 8. The Spiritual Life of the Evangelical 9. Some General Applications of Psychology to Church Work. Index.